Looking back to the 1950s and 60s many of the new public buildings that were commissioned in the UK were designed in the Brutalist style. The authorities had to rebuild a war-ravaged Britain quickly and to a restricted budget. They wanted a solution that looked modern and forward-thinking and that fitted with the excitement that followed the initial post-war depression. The New Brutalism pioneered in France by Le Corbusier was the answer. An undeniably honest approach to architecture that demanded form follow function and avoided unnecessary flourishes. The Brutalist approach was all about showing off the materials from which the building was made (inevitably concrete), about sharp angles, rough surfacing and exposed services. As with all walks of life architecture goes through different styles and fashions and the overarching trend of the time was the stark and undeniably modernist Brutalist style. This can be traced back to a number of factors; the post-war years signaled a new chapter in British history where the future was exciting, where technology was moving on apace, where the welfare state was providing care from cradle-to-grave and where rock’n’roll and fashion were dominating the headlines as Britain moved away from the war years and headed towards a brighter future. In addition to these, changes in building technology, most notably concrete technology, meant buildings could be erected swiftly and relatively cheaply compared with other more traditional construction methods. In 1950s France, Swiss architect Le Corbusier, the most influential, most admired and most criticised architect of the last century (and a very natty dresser) had been experimenting with what he called ‘beton brut’ (meaning raw concrete).This is where the term Brutalist derived from. He was an architect with a philosophy based around providing people with what he called ‘machines for living in’. The pinnacle of his career came with the Unite d’Habitation in Marseilles constructed in 1952 and arguably the first Brutalist project. Seventeen storeys high and incorporating a mixture of apartments, shops, clubs and a meeting room the building is still a success to this day and is in much demand among the middle-class professionals of Marseilles. 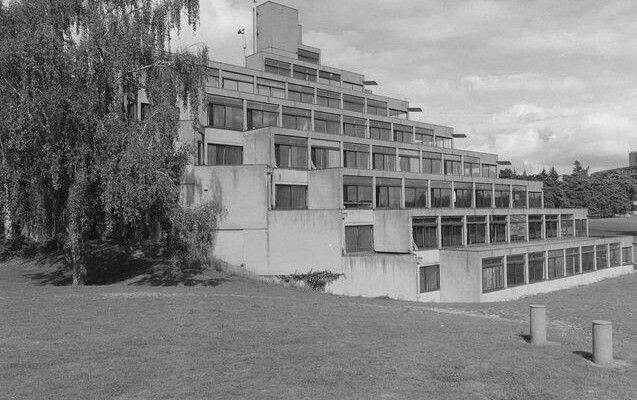 British architects seeing the success of Le Corbusier’s work and seeking a new way forward started looking to the New Brutalism and the partnership of Peter & Alison Smithson – possibly the most influential British architects of the mid-twentieth century – designed the first notable Brutalist building in the UK: Hunstanton Secondary School. This is still in use today and apparently still popular with the pupils. Enormous windows were a big feature of the school to let natural light penetrate the classrooms but also had the effect of heating them up during the summer and freezing the pupils in the winter – black panels have since been added which seems to have cured the problem. This reflects what appears to be a recurring issue with Brutalist architecture – over many years building styles had evolved and tried and tested methods were used to good effect. Brutalism turned all this on its head and was a revolution where previously evolution had been the name of the game. With this revolution came problems in terms of theoretical design not translating well into practical living and working spaces and this seems to be the main issue with Brutalism over the years. Whereas the Victorian back-to-back terraces had been slums and had seen people living in very poor conditions at least there was a sense of community and people could easily interact with each other. The Brutalist tower blocks of the 1960s prevented this happening and whilst they offered a new, cleaner living space they also took away the human interaction that is so vital to all of us. There is an overwhelming feeling that an architectural ideal took precedence over the needs of the humans living in the buildings and the backlash was quick to come gaining momentum in the late 1960s and coming to a head in the early 70s. In addition to the above Le Corbusier’s designs on the continent were generally bathed in sunshine most of the year and didn’t have the British backdrop of continual grey skies and drizzle. It seems concrete structures work well where the weather is better and unfortunately this does not take into account the UK climate. Many famous buildings in the UK have been designed in the Brutalist style but few are as iconic as Trinity Square in Gateshead also known as the Get Carter car park. Designed by the Owen Luder Partnership in 1962 when Brutalism was peaking as an architectural fashion; the building wasn’t completed until 1967 by which time public interest in Brutalist architecture was in decline. The concrete used in the construction was not as durable as it should have been and the structure started to look shabby fairly quickly. There was due to be a restaurant / café on the top floor (as discussed by Cliff Brumby and Jack Carter in Get Carter) but there were no interested parties (although it is rumoured it never got a Fire Safety Certificate because the car park ceiling heights were too low for a fire engine to reach the top). 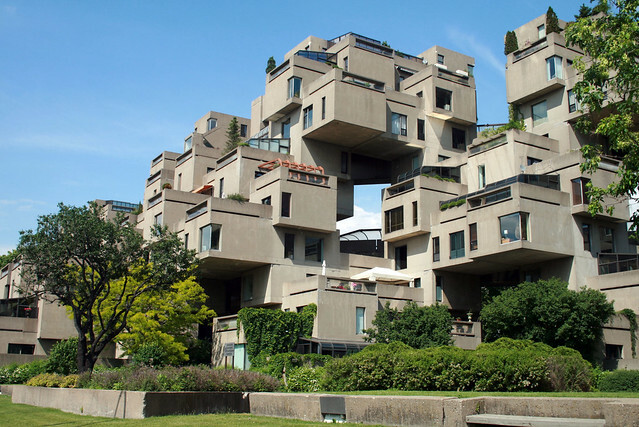 Brutalist architecture was a relatively short-lived fashion but due to the large number of building projects going on at the time of its peak leaves a lasting legacy. There are many fans as witnessed by the campaign to list and retain the Get Carter car park (including, rather bizarrely, Sly Stallone) but it was demolished in 2010. In terms of architectural history Brutalism certainly has its place but with a significant number of the original large projects either under threat or already demolished the future of many of these buildings is unsure to say the least. If you’re a fan then it may be wise to view them while you can, if you’re not then perhaps you’ll be thankful they won’t be around forever. Whichever way you look at it though, they echo the big-thinking and excitement of the times and are a reflection of a period when the future was so bright you really had to wear shades.